The inner architecture of a material can have an astonishingeffect on its overall properties and is vital to understand when designing new materials. Nature is a master at designing hierarchical structures and so researchers are looking at biological examples for inspiration, specifically to understand how nature arranges the inner architectures for a particular function in order to apply these design principles into man-made materials. 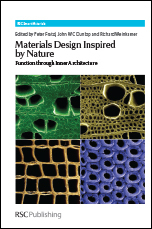 Materials Design Inspired by Nature is the first book to address the relationship between the inner architecture of natural materials and their physical properties for materials design. The book explores examples from plants, the marine world, arthropods and bacteria, where the inner architecture is exploited to obtain specific mechanical, optical or magnetic properties along with how these design principles are used in man-made products. Details of the experimental methods used to investigate hierarchical structures are also given. Written by leading experts in bio-inspired materials research, this is essential reading for anyone developing new materials. Materials Design? A Possible Playground for Bio-inspiration?